I hope that everyone had an excellent Christmas and New Year break, and have got over the pain of getting back to work. On the good news front, the fishing from boat and shore is really firing on all coasts. On the West Coast the snapper fishing has been exceptional with it sometimes seeming harder to not catch them than catch them, if you are targeting other species. The kingfish are also around in good numbers with a lot being caught as a bycatch when targetting snapper, gurnard and kahawai. These make for exciting battles as often these kingies are being caught on lighter gear. The albacore fishing really came on a few weeks ago and then we had a big sea temperature drop with a run of colder weather, and that caused the albacore to head north. They have since come back in big numbers, with Steve having a great session yesterday and getting into the double digits of fish numbers with his biggest being around seven kilos. Pictured is Steve with a couple of the albacore he brought home. As always only a couple were kept for the table and the rest were returned to fight another day. Tarakihi have also been around in fantastic numbers, with good sized fish, around 40 to 50cm, being found on most reefs in depth ranging from 50 to 70 metres. 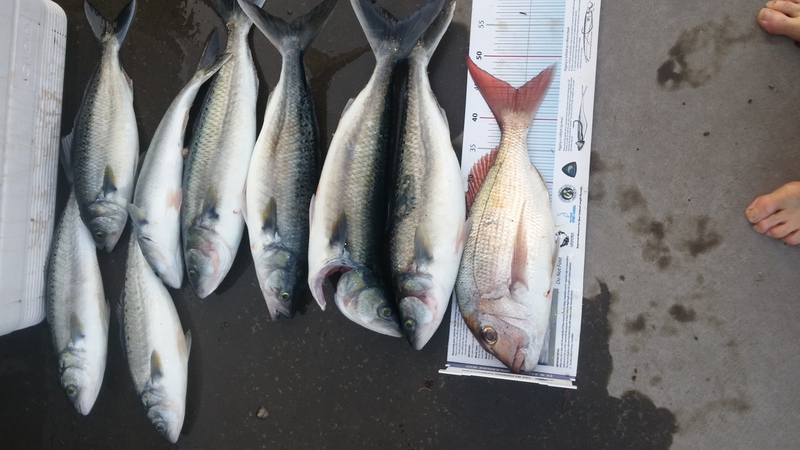 The harbour has also been fishing very well for kingfish with it not being uncommon for anglers who are targeting them to catch two or more in a mornings fishing, with fish up around 12kg being taken. Snapper fishing has been good particularly over the Eastbourne side of the harbour. Making the effort to burley, and use light traces seems to be the go for successful fishing. South Coast boat fishing has been very hit and miss with anglers going out and catching Bluenose one day and nothing the next. There are also some nice Blue Cod to be had fishing 5 Mile Reef or Turakirae. At this time of year you'll find that burleying up just outside the harbour can produce some good snapper as the water has really warmed up now. Shore fishing is fantastic this time of year, as you would expect. 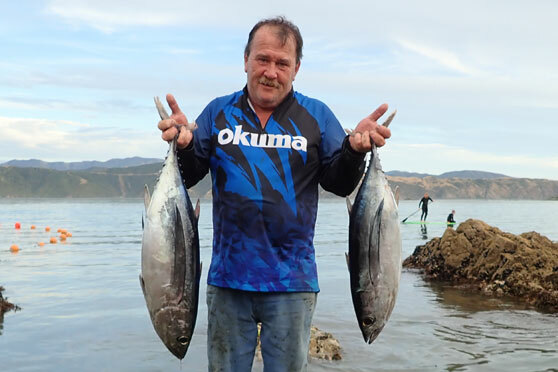 The Kingi fishing has been exceptional once again with various anglers scattered around the Harbour catching one or more fish most mornings. These are best targeted with Mackerel live baits and make for great fun for landbased anglers due to their fighting abilities. Snapper have been around in reasonable numbers on all coasts with two to three-kilo fish not being uncommon. On the open coasts, there have been some massive schools of kahawai with a lot of chunky ones around the three-kilo mark. These are the two species that everyone is targeting and hoping to catch. It has been a real pleasure to see a lot of kids and teenagers out there fishing instead of being stuck at home behind a screen. Additionally, it's great to see the level of support that mums, dads and grandparents are giving these keen young anglers. This great fishing will continue for several more months, so there are lots of opportunities ahead to get out there and wet a line. All the best for your upcoming fishing adventures!